Not just ANY breeder can list their puppies on this Cavalier Club sponsored puppy and adult referral website. Only REPUTABLE breeders, living in the above mentioned States and who are members in good standing of the Cavalier Clubs (CKCSC & CNE), are allowed to list their carefully bred puppies. Breeders are also required to adhere to the Club's strict Code of Ethics and provide written CARDIOLOGIST and OPHTHALMOLOGIST specialists' clearances for both sire and dam of all litters on this site - parents' health is therefore pre-screened. Please review and discuss with breeders, the CKCSC, USA's Recommended Health testing Guidelines. IMPORTANT: READ THE DOCUMENTS LISTED ON THE LEFT MENU OF THIS WEBSITE, ESPECIALLY THE SECTION ENTITLED ‘SELECTING A REPUTABLE BREEDER’, BEFORE YOU START YOUR SEARCH FOR A PUPPY. WELCOME to Cavaliers of the Northeast’s Puppy & Adult Referral Service website. We are committed to helping you find a responsible breeder and therefore an ideal family canine companion. If you have any questions such as training, feeding, price of a Cavalier, veterinarian fees, please do not hesitate to contact us, either by email or by telephone. We are here for you - our goal is to provide a list of excellent breeders with current available puppies to save you time when shopping for a puppy. 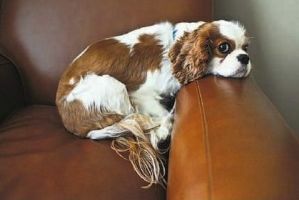 REMEMBER: An educated consumer is a Cavalier’s BEST FRIEND! Embarking upon Cavalier ownership starts NOW with educating yourself by reading the documents provided on this site, prior to contacting breeders. Then spend a little time visiting breeders, and their dogs, to observe the temperaments of the dogs and how they are cared for. Do not limit your visits to breeders close by - it could be that the best puppy for you is a few States away. Your dreams of 12 plus years with a happy, healthy Cavalier will become a reality if you go that extra mile to seek out a Cavalier that is ideal for your family and from a breeder who you respect. Dam, grandparents , great grandparents all certified board tested. On premises. If you are unable to find a Cavalier puppy, please consider adopting a Cavalier Rescue dog. Google: Cavalier Rescue USA or click here: Cavalier Rescue USA to view all the available rescue dogs in the Northeast Region. Cavaliers of the Northeast is a Cavalier Specialty Club operating under the umbrella of the original Cavalier Club that started Cavaliers in the USA in 1954, The Cavalier King Charles Spaniel Club, USA. 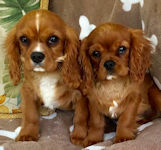 Compared to puppy mills, pet stores and brokers (all three should be avoided), the Cavalier breeders listed below carefully raise better quality puppies as family companions. You would be wise to go for the best - dogs are not objects that can be easily discarded and replaced especially as you and your family become emotionally attached. Dogs should be considered an important member of your family and as such you need to buy the best you can find. This means avoiding pet shops, internet puppies-for-sale sites and puppy brokers who import puppies for resale from Europe and various States in the USA. We believe education and effort both on your part and ours, will find you a top quality Cavalier. If you get stuck, contact us at the emails or telephone numbers at the top of this page. Unable to find a Puppy? and select your State or surrounding State. (East Coast Cavaliers) with which we have NO affiliation. of each litter by a cardiologist and ophthalmologist. Stick with the breeders on this site! All breeders listed on this website reside in the Northeast Region and are members in good standing of both CKCSC and CNE. CNE does not endorse or recommend any one breeder over another. Buyers are urged to read the contents of this website and make an educated decision as to which breeder and puppy to choose.